This premium shaving set includes our Executive Double Edge Safety Razor that is engineered to give the closest of shaves. The razor also includes ten double edge razor blades, so you can get started on that gorgeous face of yours right away. This wet shaving bundle also includes our Best Badger Hair Shaving Brush. This incredibly soft shaving brush is ideal for brushing on a rich lather, lifting the hairs up off your skin to prevent ingrown hair, and exfoliating your beautiful face. Perfect for the guy who enjoys a good shave. To top it off, we throw in our Stainless Steel Lather Bowl and stand.This bowl is the perfect size for building a rich bowl lather with our shaving brush. It fits perfectly in the palm of your hand, does not clutter up your sink, and looks fantastic. If you're the type of guy that loves a good shave, this set is for you. If you don't love a good shave, give our set a go, you'll love it soon enough. There is a wave coming. More and more men are tired of tearing up their faces with over-priced plastic razors. More and more men are realizing how they take care of themselves in the morning matters. More and more men are turning to The Clean Shave Finest Shaving Kit. Do not miss this wave. Our shaving kit is not the cheapest, it is the best. Hands down. Our double edged safety razor will last a lifetime - literally. Our Best Badger Hair Shaving Brush lifts the whiskers off your face and eliminates ingrown hairs. Our shaving bowl is the perfect size for your favorite soap puck. And our tuxedo shaving stand puts it all together and adds some serious class to your bathroom. Don't hide your razor, men. Display it with pride. For it is a work of craftsmanship. 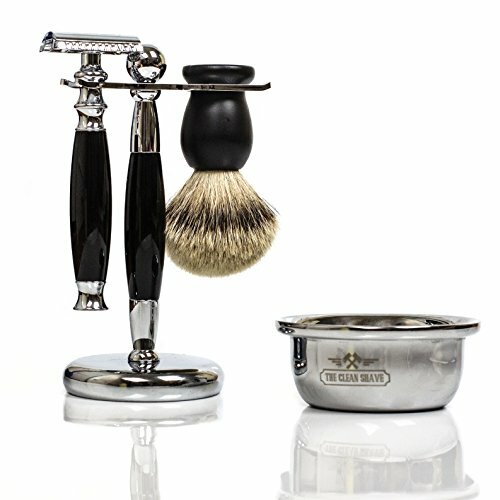 So do you want the best shaving set or the cheapest? Which set does that handsome face of yours deserve? The best. You deserve The Clean Shave Wet Shaving Set. Perfect gift for your guy or those scruffy friends of his he calls groomsmen. Hurry, though. We pride ourselves on quality, and only manufacture in small batches. If you have any questions about this product by The Clean Shave, contact us by completing and submitting the form below. If you are looking for a specif part number, please include it with your message. Calvin Klein OBSESSION for Men After Shave Balm, 5 fl. oz.